Evelyn Luella Moore was born and received her primary education in Manitou, Manitoba. She attended the Manitoba Normal School and worked as an educator, later attending the University of Manitoba and graduating as a Home Economist in 1919. She worked for the T. Eaton Company as a fabric tester until 1924, when she married Reginald Ames. Five years later she became a single parent with two children, Geraldine and Lloyd. 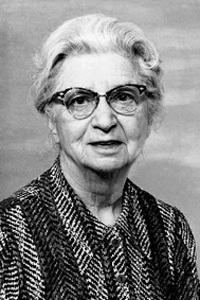 Evelyn joined the Manitoba Department of Agriculture Extension Service in 1929. She developed and taught short courses in homemaking skills to women living in rural Manitoba. With courses in great demand, the ‘local leader’ model was used to broaden the reach of classes and develop skills ranging from parliamentary procedure, nutrition, food preparation and preservation to sewing, interior design, home nursing, quilting and landscaping. Over a period of several weeks she taught each course lesson to women in a series of centres around Manitoba. Each woman returned to her community to teach the lesson to another group. The courses culminated with an Achievement Day where all participants from the smaller groups gathered together to model the articles they made and display sample books demonstrating their new skills. Every year these courses and the influence of Home Economists resulted in hundreds of women honing their talents and developing skills and new confidence. Many of the participants became community leaders in 4-H clubs, Women’s Institutes, local fairs, and numerous other organizations. During the 1930’s, Evelyn’s concern for the economic situation of rural families motivated her to seek assistance from the Manitoba Craft Council. Women purchased and completed craft kits from the Council, returned them for sale and received remuneration to supplement their family income. In her thirty years with the Extension Service Evelyn travelled through much of Manitoba, primarily by bus and train, with final destinations reached by everything from Bennett Buggy to snowmobile. Contending with unpredictable weather, poor roads, difficult transportation and a load of bulky instructional equipment posed challenges only the most dedicated and determined person could meet. And Mrs. Ames met them all! As a Home Economist, then Supervisor of Home Economics for the Province’s Department of Agriculture and finally as secretary to the Manitoba Women’s Institute, Evelyn Ames provided strong leadership and diverse knowledge for hundreds of Manitoba women. Evelyn Ames made a tremendous contribution to the people of Manitoba through her efforts in assisting women to improve personal skills, home and family lives and social interaction. Her working life covered that era of economic difficulties encountered by prairie people during years of drought and World War II. She used her education to help people help themselves.